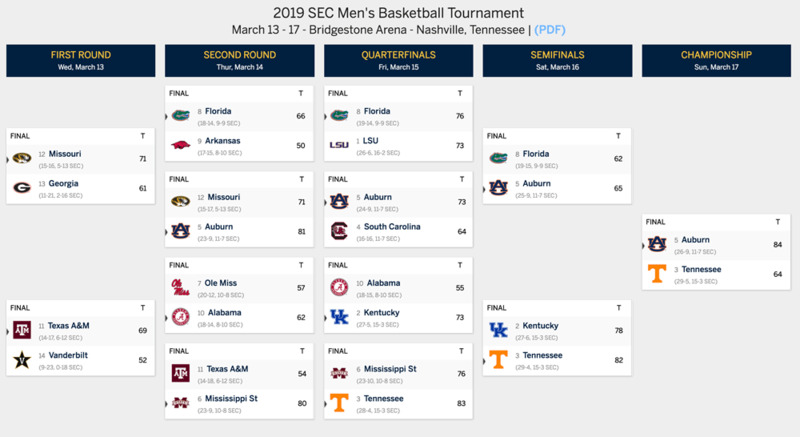 The 2019 SEC Tournament concluded Sunday, March 17, in Nashville, with the title game. Find the bracket, scores, schedule and seeding information below. Auburn routed Tennessee for the SEC crown on Sunday. On Saturday, Auburn outlasted Florida in Saturday's first semifinal. Tennessee beat Kentucky in a nail-bitter to earn a shot in the championship. Click or tap here for an SEC scoreboard. You can also tap or click on any game below to be taken directly to that live scoreboard or recap after a game is finished. Here are the SEC champions going back to 2000. Kentucky has won four consecutive titles. Florida is the most recent non-Kentucky champion, winning in 2014 — against Kentucky.